My theory of acquiring programming books is that you don't need a lot; you just need the best. Here are the books that I recommend. 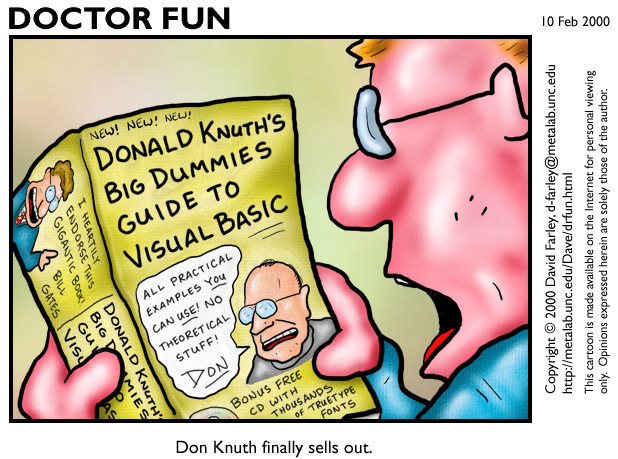 If you're not sure who Donald Knuth is or why this cartoon is so funny, then there's a serious gap in your education. Click here to find out about Donald Knuth's books, read about him in Out of Their Minds: The Lives and Discoveries of 15 Great Computer Scientists, and visit his web site. Copyright &COPY; 1999-2004 K. N. King. All rights reserved.